If you’ve conquered China, then India — the world’s second-largest country based on population — is the obvious next port of call, and that’s exactly what has happened in the world of consumer apps. The list of top Chinese apps includes major names like ByteDance, the world’s highest-valued startup, which offers TikTok and local language news app Helo in India, and Alibaba’s UCbrowser, as well as lesser-known quantities like Tencent-backed NewsDog and quiet-yet-prolific streaming app maker Bigo. 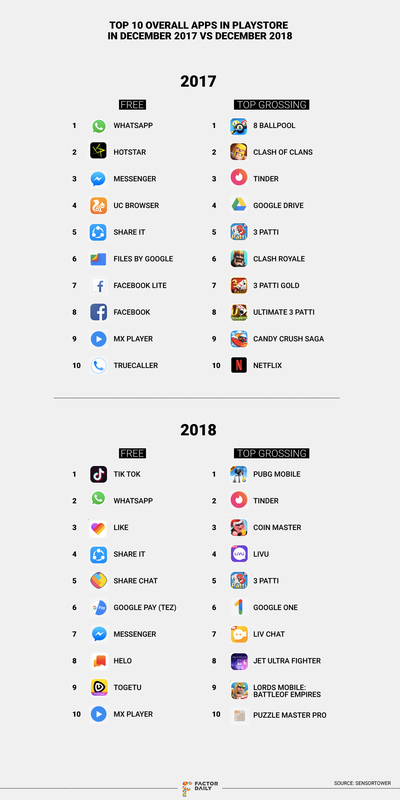 Citing data from Sensor Tower, the report found that five of the top 10 Android apps in India are from China, up from just two at the end of 2017. For anyone who has been watching the Indian technology scene in recent years, this “Chinese app store invasion” will be of little surprise, although the speed of change has been unexpected. China’s two biggest companies, Alibaba and Tencent, have poured significant amounts into promising Indian startups in recent years, setting the stage for others to follow suit and move into India in search of growth. Alibaba bought into Snapdeal and Paytm via multi-hundred-million-dollar investments in 2015, and the pace has only quickened since then. In 2017, Tencent invested in Gaana (music streaming) and Swiggy (food delivery) in major deals, having backed Byju’s (education) and Ola (ride-hailing) the year prior. The pair also launched local cloud computing services inside India last year. Beyond those two, Xiaomi has gone beyond selling phones to back local companies and develop local services for its customers. That local approach appears to have been the key for those app makers which have found success in India. Rather than taking a very rigid approach like Chinese messaging app WeChat — owned by Tencent, which failed in India — the likes of ByteDance have developed local teams and, in some cases, entirely local apps dedicated to India. With the next hundreds of millions of internet users in India tipped to come from more rural parts of the country, vernacular languages, local content and voice-enabled tech are some of the key strategies that, like their phone-making cousins, Chinese app developers will need to focus on to ensure that they aren’t just a flash in the pan in India. You can read more at FactorDaily. There are some gadgets that are nice to have – iPhones, sous vide wands – and some gadgets that you must have. Proxxi fits in the latter camp. Proxxi is an always-on sensor that buzzes when it gets too close to high voltage electricity. It’s worn by mechanics and electricians and alerts them when they’re approaching something dangerous. The Vancouver-based company just sold out of its initial commercial evaluation units and they’re building a huge business supplying these clever little bracelets to GE, Con Edison, Exelon, Baker Hughes, Schneider Electric and ABB. The bracelet connects to an app that lets workers silence warnings if they’re working on something that is energized and it also tracks the number of potentially harmful interactions wirelessly. This lets management know exactly where the trouble spots are before they happen. If, for example, it senses many close brushes with highly charged gear it lets management investigate and take care of the problem. Founded by Richard Sim and Campbell Macdonald, the company has orders for thousands of units, a testament to the must-have nature of their product. They raised $700,000 in angel funding. The company began when British Columbia Hydro tasked Sim to research a product that would protect workers from electricity. Macdonald, whose background is in hardware and programming, instead built a prototype and showed it around. “It’s a $40 billion problem,” he said. The goal is to create something that can be used all day. Unlike other sensors that are used only in dangerous situations, Proxxi is designed to be put on in the morning and taken off at night, after work. “There are other induction sensors out there, but they are focused on high risk scenarios, ie, people use them when they think they are at risk. The trouble is you can’t tell when you are at risk. You can’t sense that you have made a mistake in the safety process,” said Macdonald. The goal, he said, is to prevent human error and, ultimately, death. Not bad for a wearable. Tokyoflash is one of my favorite watchmakers. Unabashedly analog, the watches pay homage to giant robots and old tech, looking like a cross between something that you could find in the hatch in Lost and a Shinjuku fever dream. Now the company has launched the Radar LED watch, a clever piece that shows the time with sweeping beams of light that flash across the watch face. The watch features a USB-rechargeable movement and a mineral crystal with silk-screen cross-hairs and markers. Behind the glass are a set of LEDs that either blink when you raise the watch to look at the time or tap a side button. No step counters or notifications mar the stark simplicity of this strange watch. The time flashes up on the face and disappears just as quickly. Like most Tokyoflash watches, this thing is hard to read at first. I suspect it becomes an acquired skill. While you won’t be able to scan for bogeys for real on this decidedly unsmart watch, it makes for an interesting – if bold – conversation starter. It’s shipping now for $189.